If you love to attract all birds to your yard, then you cannot forget about the hummingbird. They are such a beautiful and yet tiny bird and once you attract them, you will enjoy watching them feed. If you have a flower garden they may have already visited your yard, but if you want to help them in nature and give them a little boost at the same time enjoying them yourself, then getting a specific hummingbird feeder will have them entertaining you in no time. I have found some beautiful feeders in different stores, but was amazed just how many unique feeders you can get online as well. These will make the perfect gift for the bird lover on your list too. Fill them with homemade hummingbird food CLICK HERE for the recipe. You do not need the red dye to attract them, the colors alone do that. In a hurry?? Click this link to see a huge variety of hummingbird feeders. From simple to exotic and all the ones in between. Once you attract them to your yard they will find your feeders and they are such fun to watch. Plant some red or orange flowers near by and that will help them find your yard. They also make great gifts for house warming or just because they love birds. I love the unique styles, and have a few picks below. Can you imagine having your morning coffee and watching these little guys feed? There is something unique about these gorgeous little birds. I love how they dip those long beaks into the nectar. These little birds need to eat all the time as they have a fast metabolism, so once you start a feeder, it is important to keep it clean and full of fresh nectar. Once you have attracted them to your yard, you can take this further and attract them to your hand! These kits are simply miniature feeders and after following the instructions you can find out just how to enjoy these little birds up close. These are really beautiful and colorful and will hang like jewels in your yard. You can hang these off of planter hooks or branches. You can put a few around the garden. Their shape makes them easier to clean than most traditional feeders. Apparently from some research I found that these little birds love to perch in a tree or large shrub nearby to watch over their food source and to rest. They burn a lot of energy and they love to perch inbetween feedings. This would be a great way to keep them nearby and still enjoy their company. The one thing I really love about these glass feeders, is that they not only feed your little friends but they decorate the yard as well. If you want to add bling to your space, then adding decorations that can serve a couple of purposes works well. Just make sure they are securely placed. This particular one has a built in ant mote to resist insects and has many ports for that busy hummingbird station. Easy to clean too. This one is really cool. Very simply and feeds one. You could hang this in shrubs or anywhere there are other flowers and protection. If you are looking for something unique, this is it. Easy to clean and easy to hang. This one is definitely unique and will add some bling and creativity to your yard. As you can see all you need is the red glass or flower port and they will find it. Try and place your feeder near some protective trees or shrubs and it won't take long for them to find your yard and keep coming back. This is a beautiful feeder. As with many nice treats out their for your feathered friends, ants and other insects try to get in on the action. Most ants will try to come down the hook to get to the sweet nectar, and ants will put the hummingbirds off. I noticed they would hove and not feed if ants were in their way, even the tiny ants. So I quite often quickly spray the feeder with some water and that washes them off, but if you have a lot of trouble you can actually purchase an ant mote as above. I always loved all the different shaped and unique feeders you could get to attract this little birds, but sometimes cleaning them could get involved. I usually swish mine out once a week with hot water, but sometimes it can be hard to get into those curves. This brush is specifically designed just for that job. 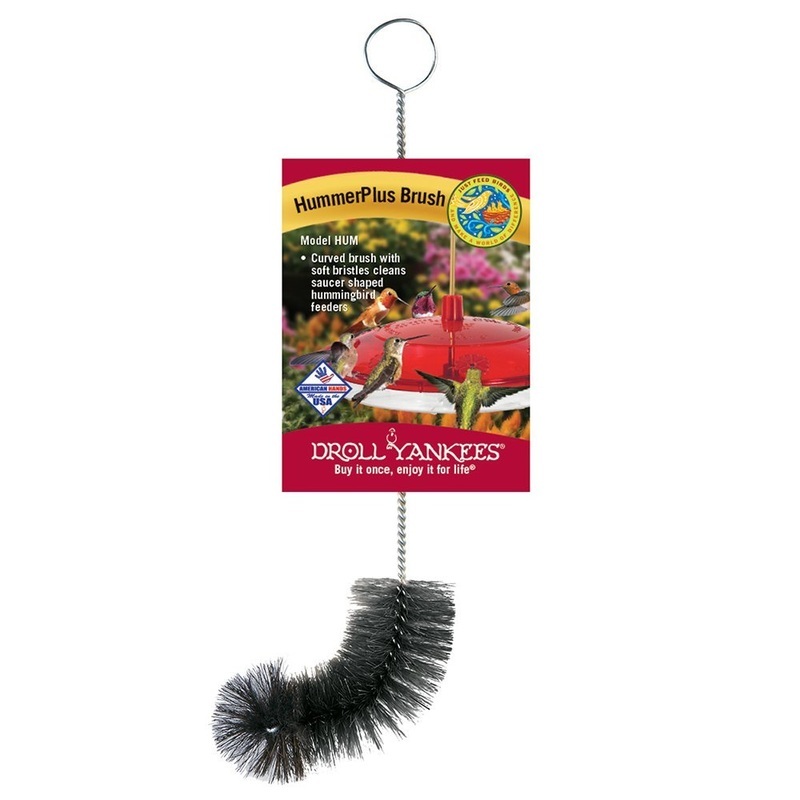 If you have quite a few feeders in your yard, investing in one of these brushes would make the work easier. Hope you enjoyed seeing all the different feeders you can get for attracting hummingbirds to your yard or to give as gifts. They are all affordable and I have found online is a great place to get started. Where I live in Ontario, Canada, we only get to see these beautiful little hummingbirds for a short few months. June to September and then they are off down south again for our winters. So it is a beautiful sight to have in our short summers. Just click on any of the pictures to see the available feeders on Amazon and see others. You can make your own food very easily by checking out my quick homemade recipe. Simply white sugar and water, boil and you are done.